Q3 2010 TELUS investor conference call Robert McFarlane EVP & Chief Financial Officer Darren Entwistle President & Chief Executive Officer Joe Natale EVP. 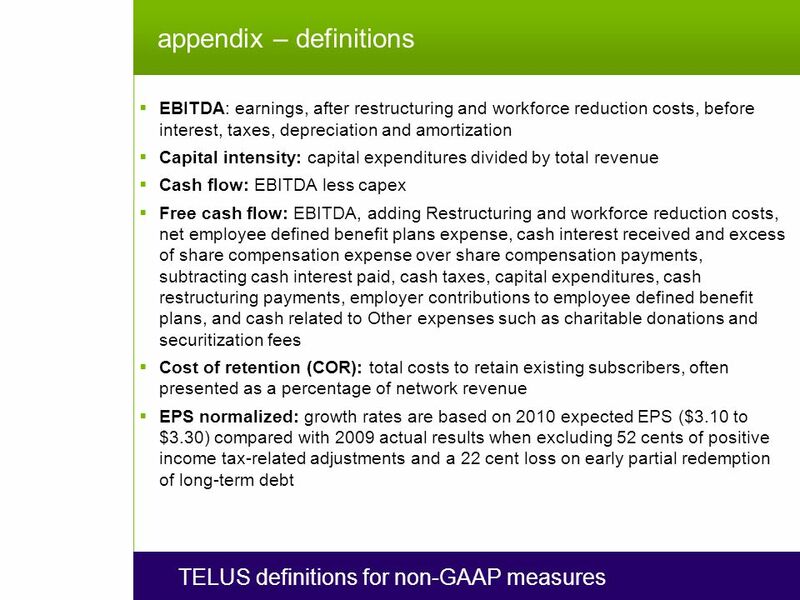 2 2 TELUS forward looking statements Today's presentation and answers to questions contain statements about expected future events and financial and operating performance of TELUS that are forward-looking. By their nature, forward-looking statements require the Company to make assumptions and predictions and are subject to inherent risks and uncertainties. 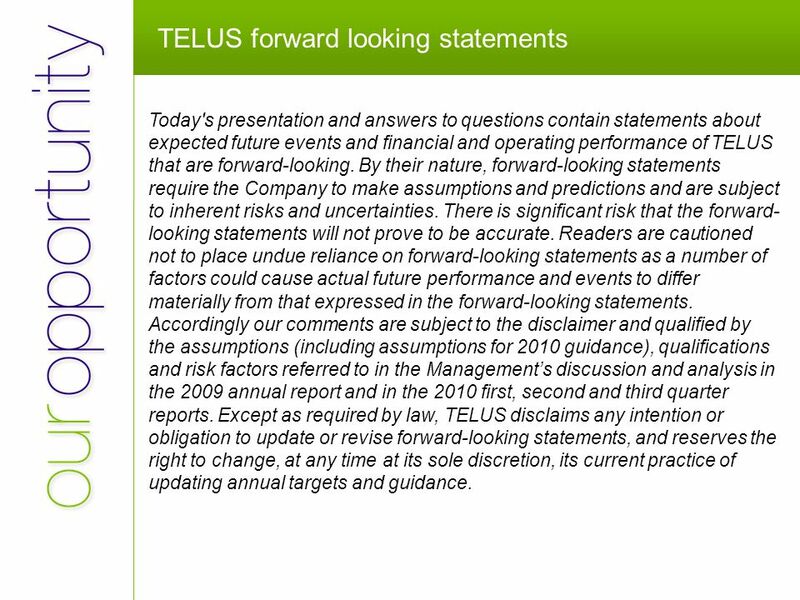 There is significant risk that the forward- looking statements will not prove to be accurate. Readers are cautioned not to place undue reliance on forward-looking statements as a number of factors could cause actual future performance and events to differ materially from that expressed in the forward-looking statements. 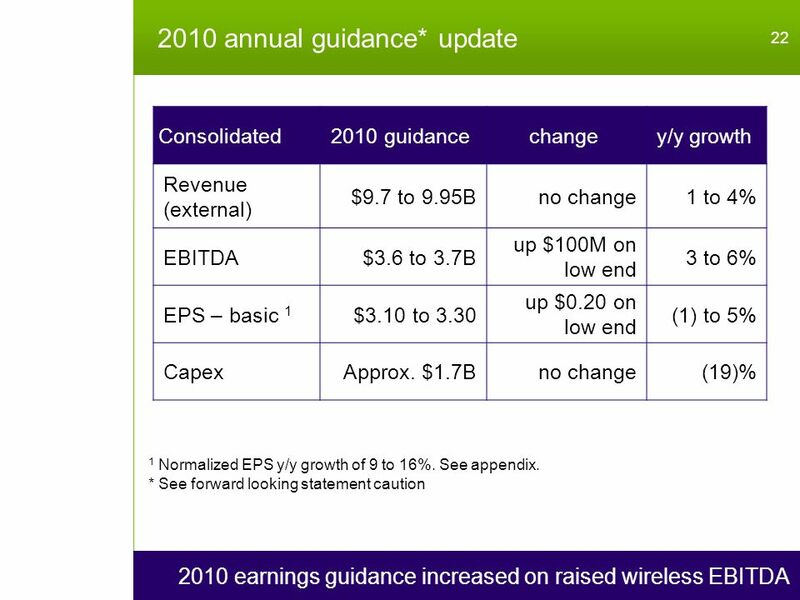 Accordingly our comments are subject to the disclaimer and qualified by the assumptions (including assumptions for 2010 guidance), qualifications and risk factors referred to in the Management’s discussion and analysis in the 2009 annual report and in the 2010 first, second and third quarter reports. 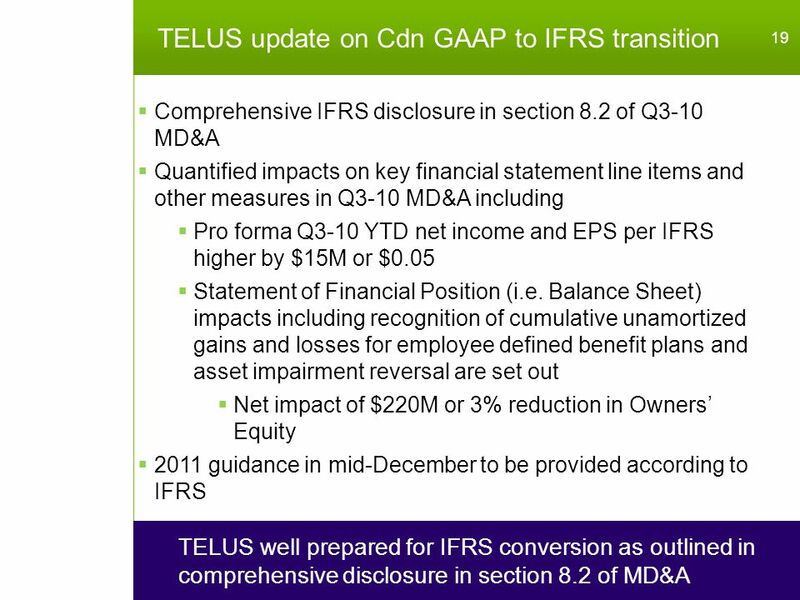 Except as required by law, TELUS disclaims any intention or obligation to update or revise forward-looking statements, and reserves the right to change, at any time at its sole discretion, its current practice of updating annual targets and guidance. 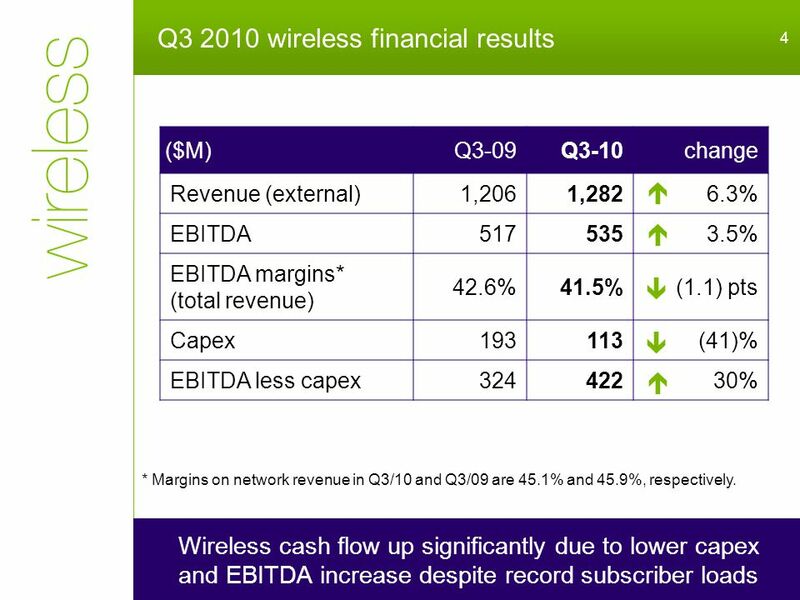 4 Q3 2010 wireless financial results 4 Wireless cash flow up significantly due to lower capex and EBITDA increase despite record subscriber loads ($M)Q3-09Q3-10change Revenue (external)1,2061,2826.3% EBITDA5175353.5% EBITDA margins* (total revenue) 42.6%41.5%(1.1) pts Capex193113(41)% EBITDA less capex32442230%      * Margins on network revenue in Q3/10 and Q3/09 are 45.1% and 45.9%, respectively. 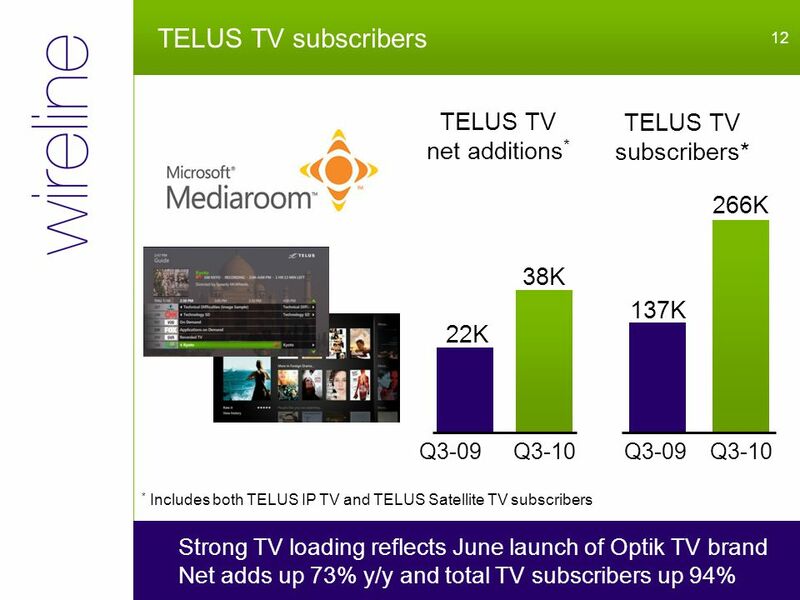 Download ppt "Q3 2010 TELUS investor conference call Robert McFarlane EVP & Chief Financial Officer Darren Entwistle President & Chief Executive Officer Joe Natale EVP." Robert McFarlane EVP & Chief Financial Officer Joe Natale EVP & Chief Commercial Officer Darren Entwistle President & Chief Executive Officer May 5, 2011. 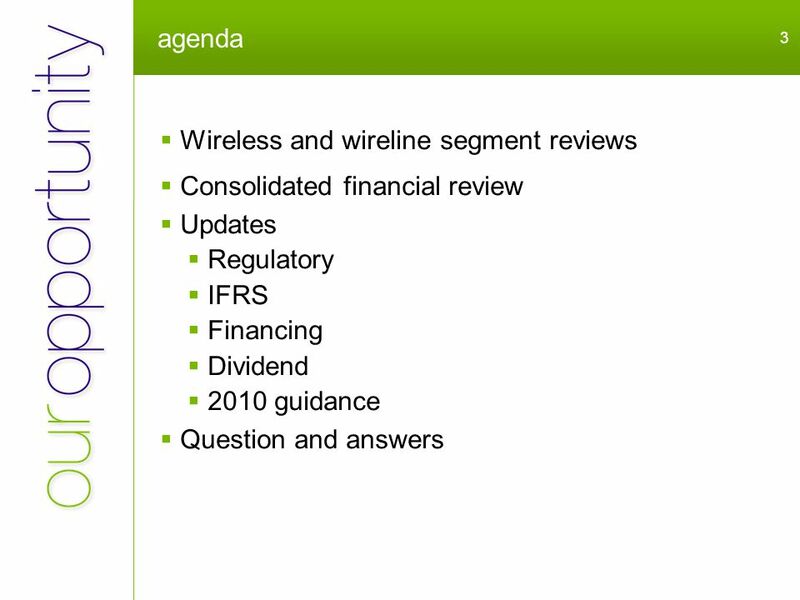 Q investor conference call August 7, 2014 Darren Entwistle, Executive Chair Joe Natale, President and Chief Executive Officer John Gossling, EVP. February 13, 2009 Q TELUS investor conference call Robert McFarlane EVP & Chief Financial Officer Darren Entwistle President & CEO. 2012 RBC Fixed Income Conference Robert McFarlane EVP & Chief Financial Officer May 15, 2012. 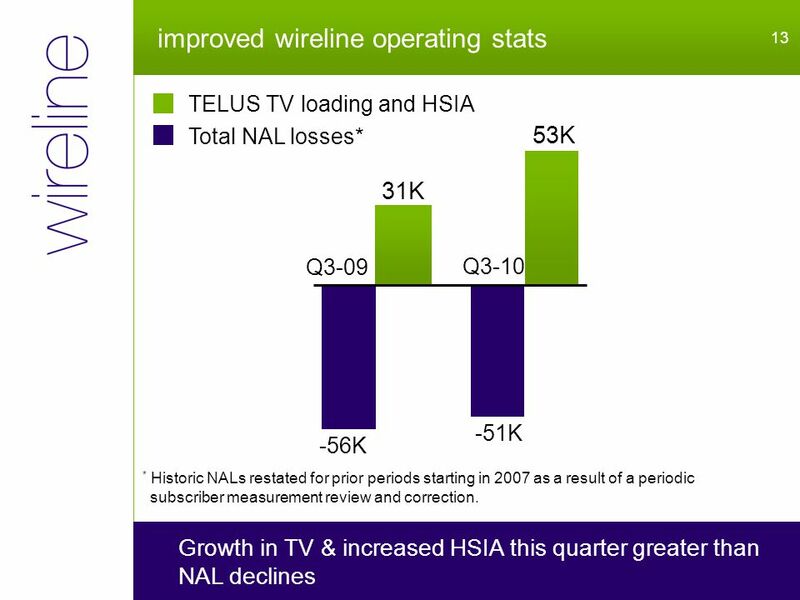 Q TELUS investor conference call May 9, 2013 Darren Entwistle President & Chief Executive Officer Joe Natale EVP & Chief Commercial Officer John. 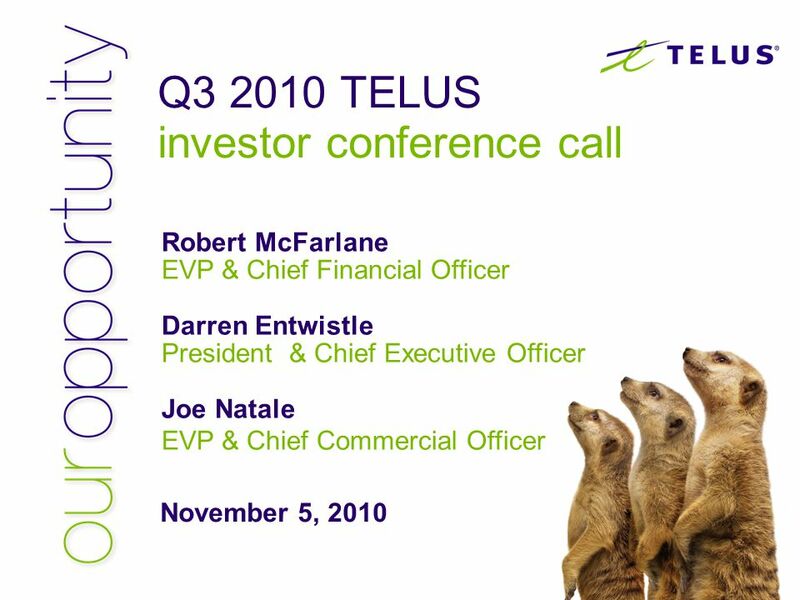 Q TELUS investor conference call November 9, 2012 Robert McFarlane EVP & Chief Financial Officer Joe Natale EVP & Chief Commercial Officer Darren. Robert McFarlane EVP & Chief Financial Officer January 20, 2012 CIBC World Markets Whistler Institutional Investor Conference. Robert McFarlane EVP & Chief Financial Officer Joe Natale EVP & Chief Commercial Officer Darren Entwistle President & Chief Executive Officer November. 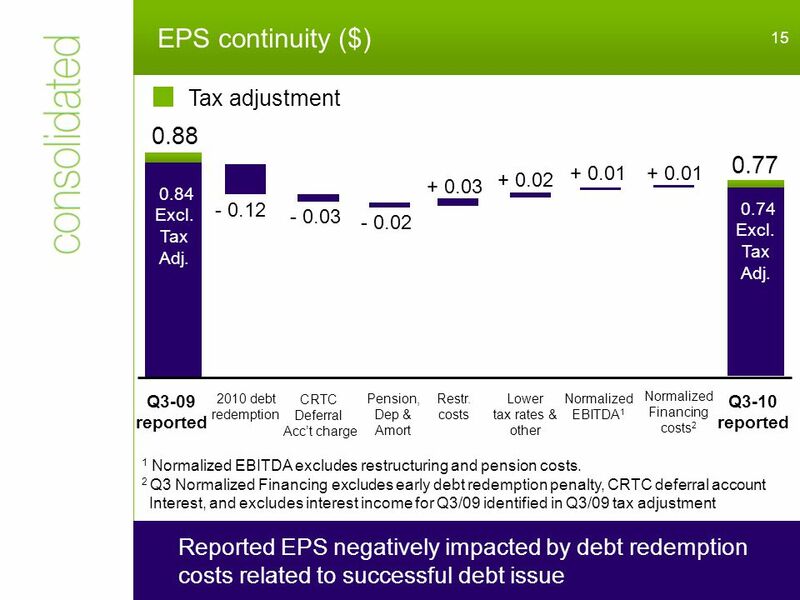 Q TELUS investor conference call Robert McFarlane EVP & Chief Financial Officer February 16, 2006. 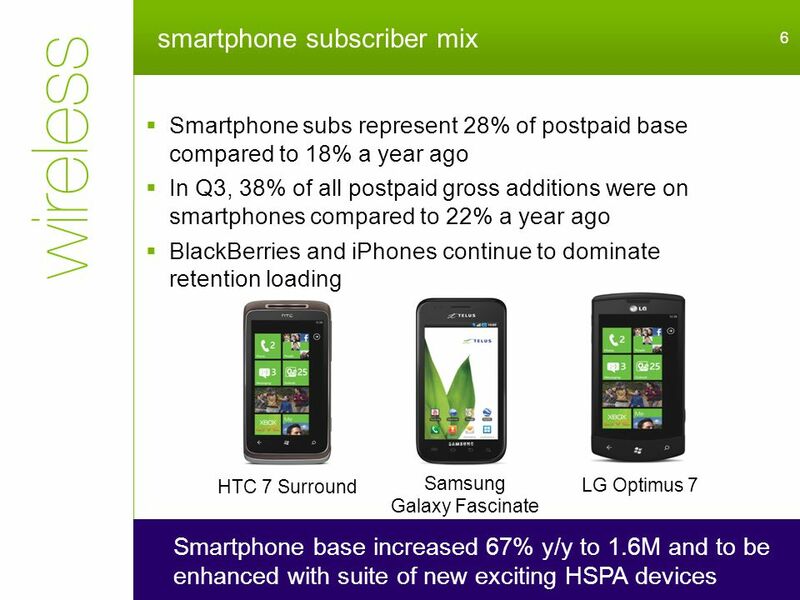 Q investor conference call November 6, 2014 Darren Entwistle, Executive Chair Joe Natale, President and Chief Executive Officer John Gossling, EVP. 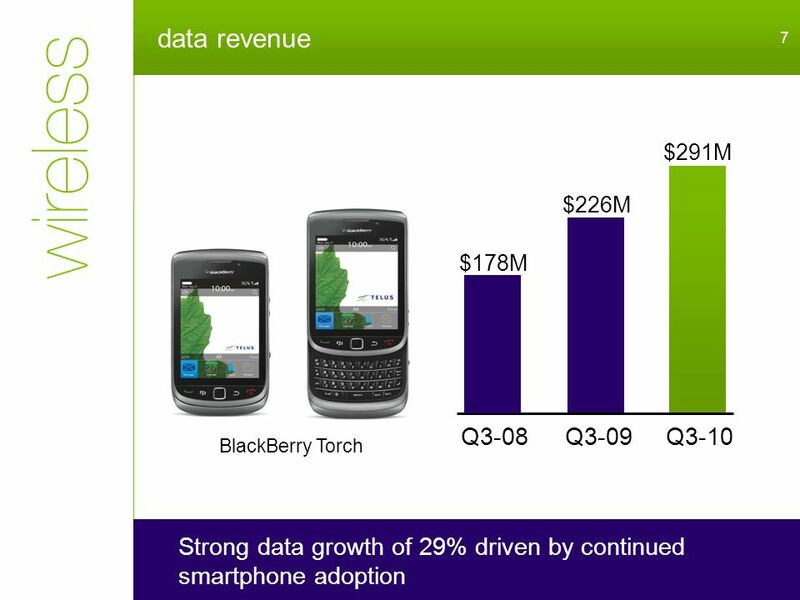 Q TELUS investor conference call August 4, 2006. 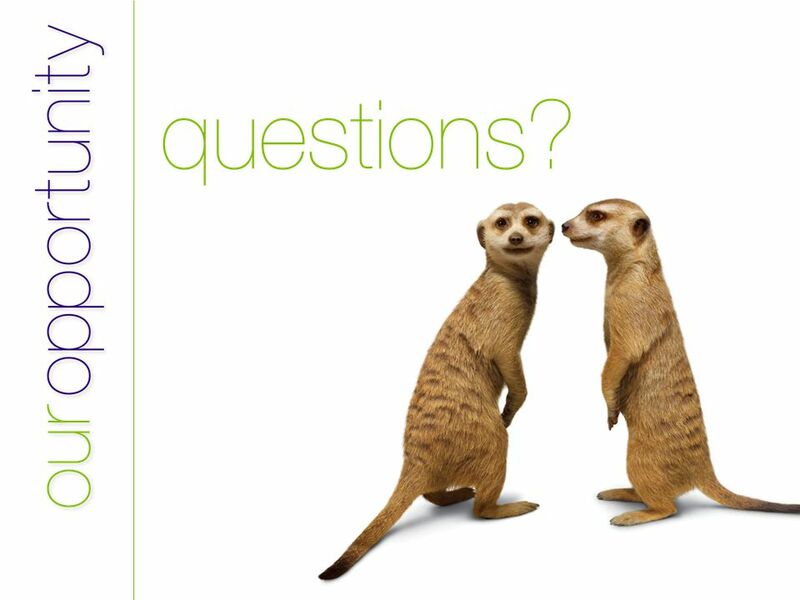 Q TELUS investor conference call Robert McFarlane EVP & Chief Financial Officer Darren Entwistle President & Chief Executive Officer Joe Natale EVP. 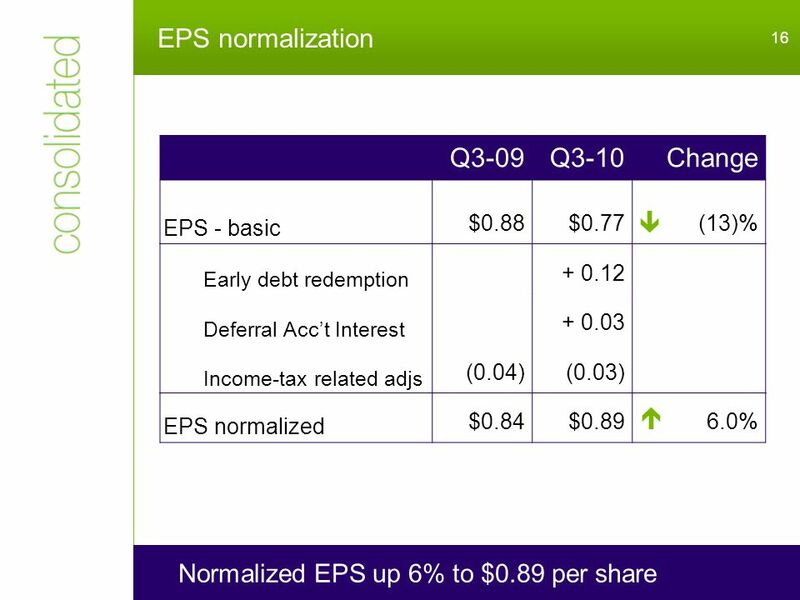 Q and 2014 targets investor conference call February 13, 2014 Darren Entwistle President & Chief Executive Officer Joe Natale EVP & Chief Commercial. 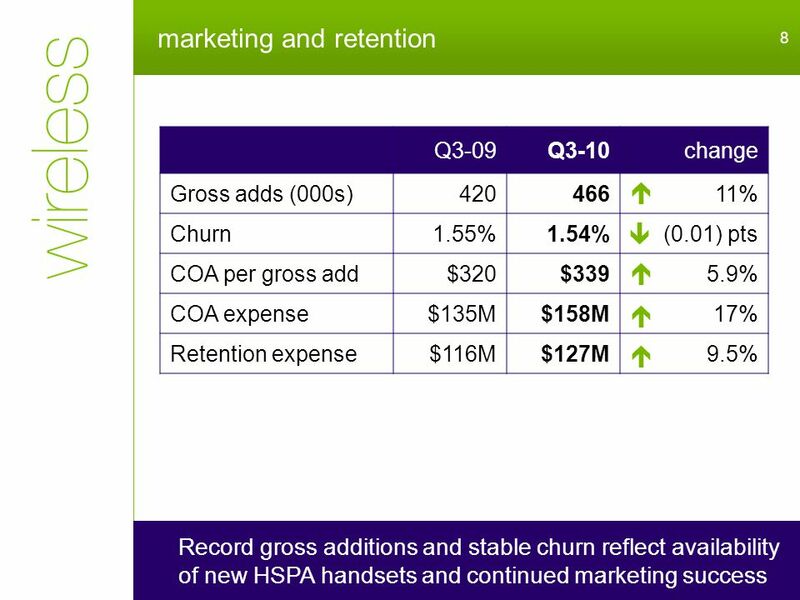 Q investor conference call November 8, 2013 Darren Entwistle President & Chief Executive Officer Joe Natale EVP & Chief Commercial Officer John Gossling. 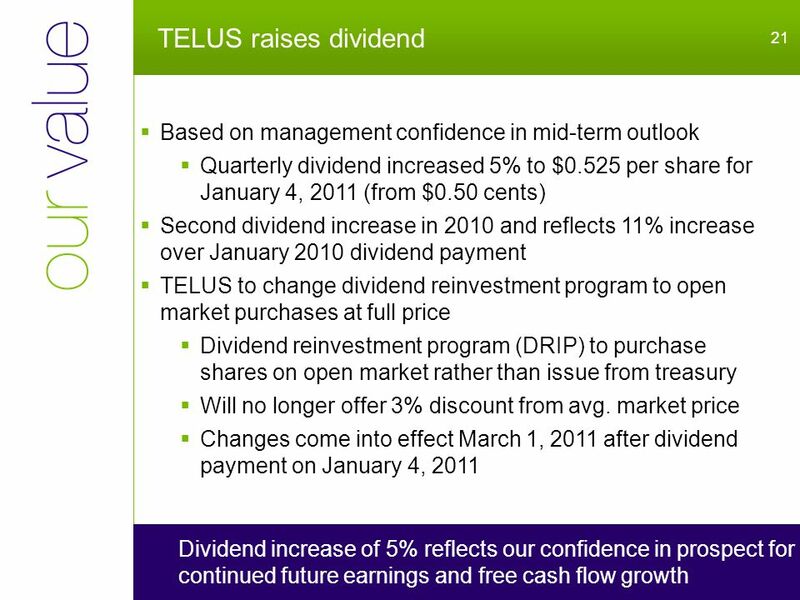 February 12, 2010 Q TELUS investor conference call Darren Entwistle President & CEO Robert McFarlane EVP & Chief Financial Officer. 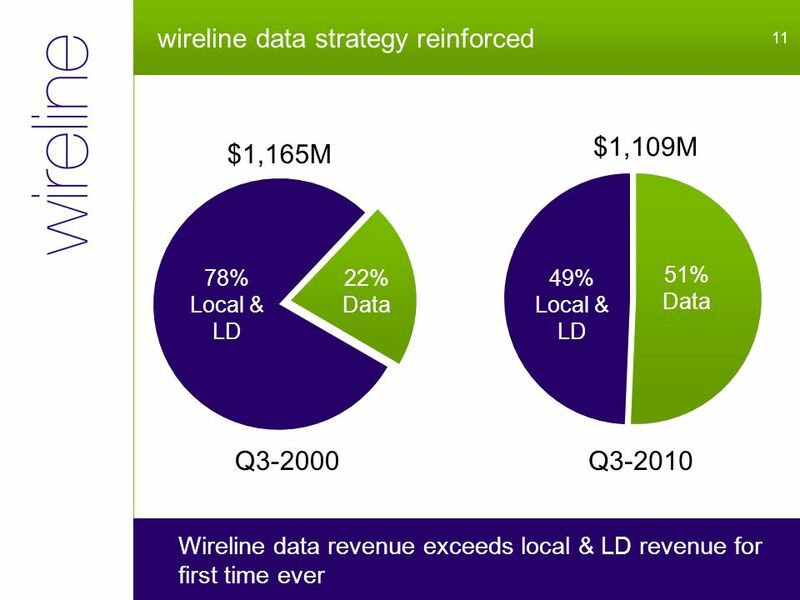 Q2 2014 investor conference call August 7, 2014 Darren Entwistle, Executive Chair Joe Natale, President and Chief Executive Officer John Gossling, EVP.